15"x20" Illustration Board After drawing "Earthbound" with Kohinoor's technical pen I was anxious to see how Staedtler's and Prismacolor's brand of fineline markers would compare to Kohinoor. (See "Study 5" & "Study 6" ). With Kohinoor, I use 0.25mm, 0.18mm, & 0.13mm nibs. The Prismacolor pen has a 0.13mm nib but only has 8 colors. The Staedtler pen has only a 0.30mm nib but has 20 colors. The subject I've chosen will challenge the ability of the markers to convey the range of green I'll require. SPECIAL NOTE: Even after mounting my digital camera on a tripod and taking the pictures with marginally controlled lighting, I could not capture the small pen lines. This is an unfortunate limitation but, although disappointing, the results achieved should be sufficient. • Although not evident at this point, the central inked plant is actually climbing a tilted and weathered cedar fence post. Another is at far right with a split cedar board spanning the two. • At this point I have nearly completed the tightly drafted underdrawing. I must still define the open patches of cedar branch clusters and define the long grassy weeds for the left center area behind the barbed wire. 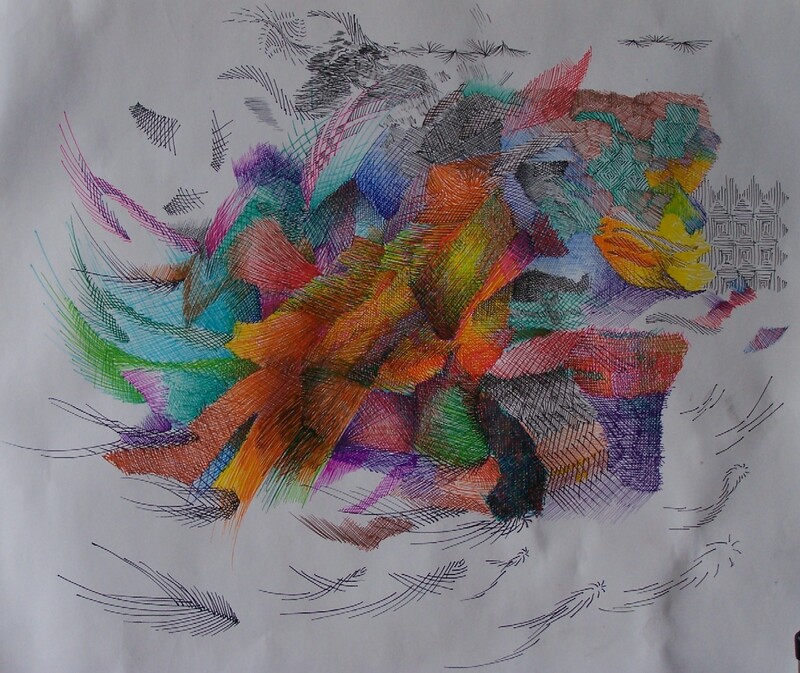 • The next areas to be inked will be the long slendor grasses and weeds in the forground including the full development of the foxtails and grass seed heads. This will help assure the fragile nature of the foxtails' and seed heads' pen strokes can be preserved when I begin inking the leaf growth behind them. 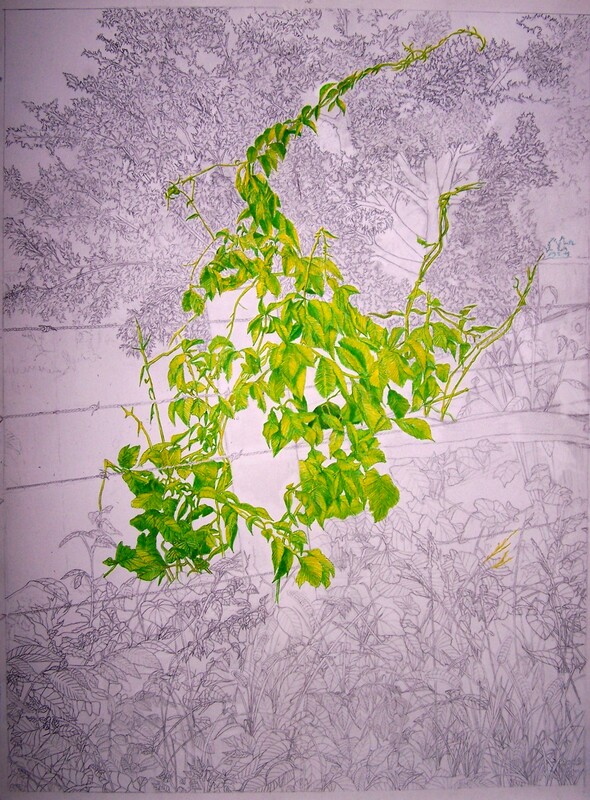 • Then, to take a break from the dense foliage, I will ink the cedar trees' exposed branches using redish browns, umbers, and dark and light greys. • The dense leafy foliage of the foreground and the sinuous cedar masses of the background will be the greatest challenge and will require the greatest concentration. • I will eventually ink a sky blue background in the upper and mid left and warm yellow and light green grasses below it. 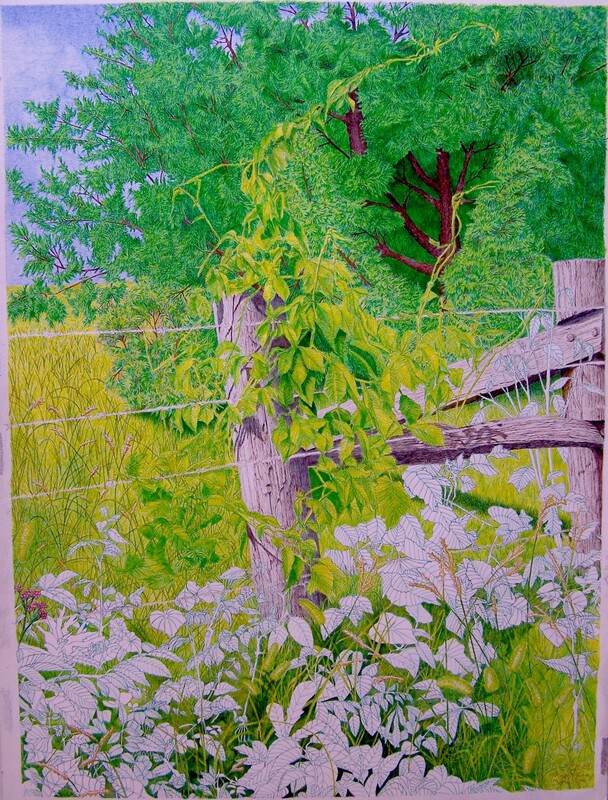 • Once the entire pencil underdrawing is complete, the task is to ink all of the outlines in the appropriate local color using the Prismacolor pens: green or blue for the foliage, sepia for the tree trunks, and light grey for the posts. All traces of graphite are completely erased during this part of the process. • Next, I inked all of the grasses, seedheads, and foxtails, and all branches and trunks. 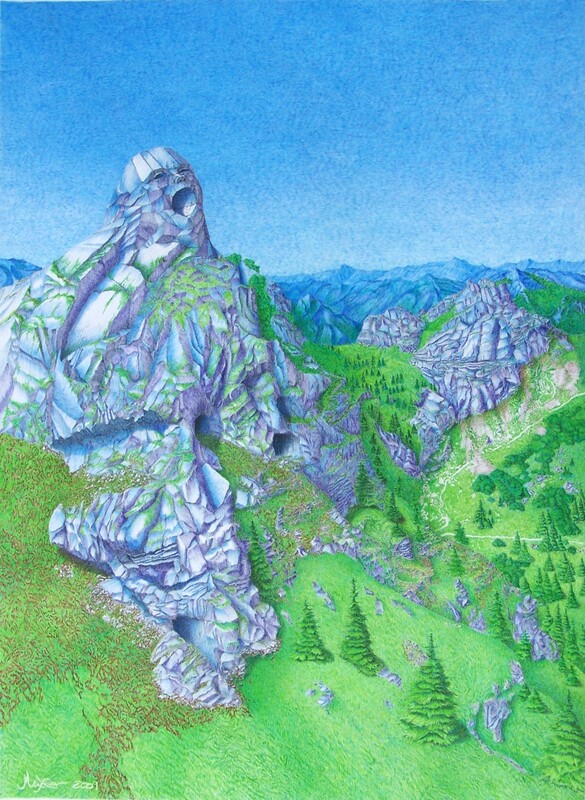 • At this point I changed my strategy and decided that, by completely defining the "ground" from the horizon just above midline to the ground beneath the foliage, I would have a more precise feel of space and perspective when inking the foreground and cedar foliage. I used a combination of Prismacolor's green, blue, and sepia with Staedtler's yellow. 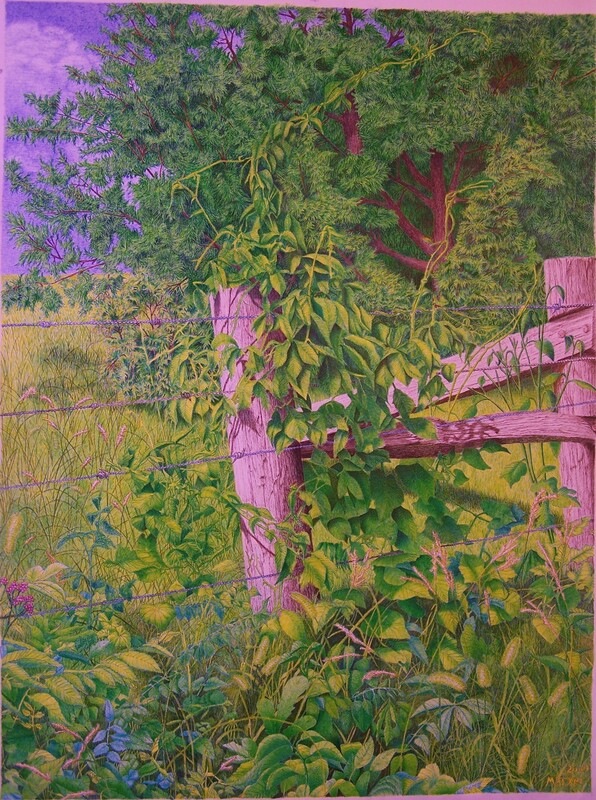 • Just as a test, I put un undercoat of Staedtler's light green on two of the cedar branches at left. I think this will work fine once it is finished off with one our two other more-saturated blues, greens, and yellow pens. • The fence posts, the lower cross beam (between the two posts), and the anchor beam (anchoring the post at right) are now complete, as is the angled ground shadow of the upper anchor beam. • I have treated about a third of the background cedar foliage with a "foundation" layer of light green. 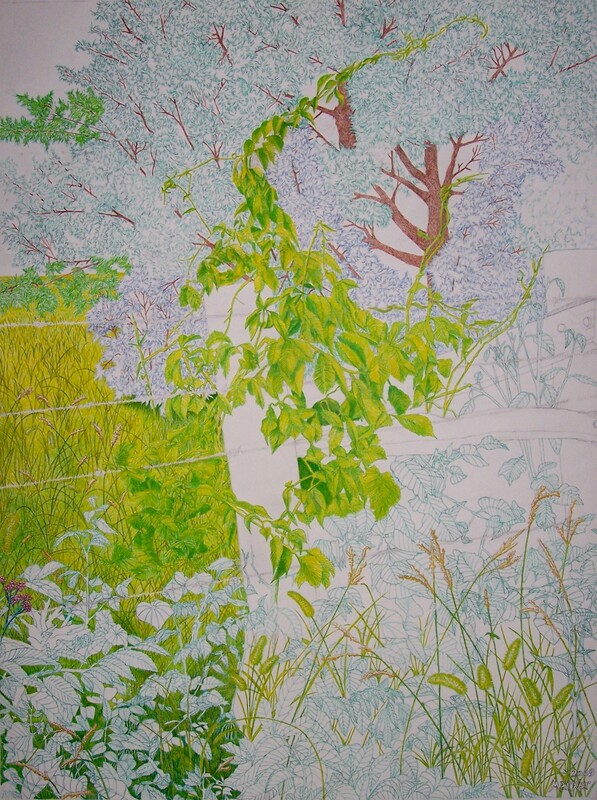 Once all the foliage has this foundation layer, I can detail the darker, shadowed foliage in the next layer of green to increase perspective and deepen the space. 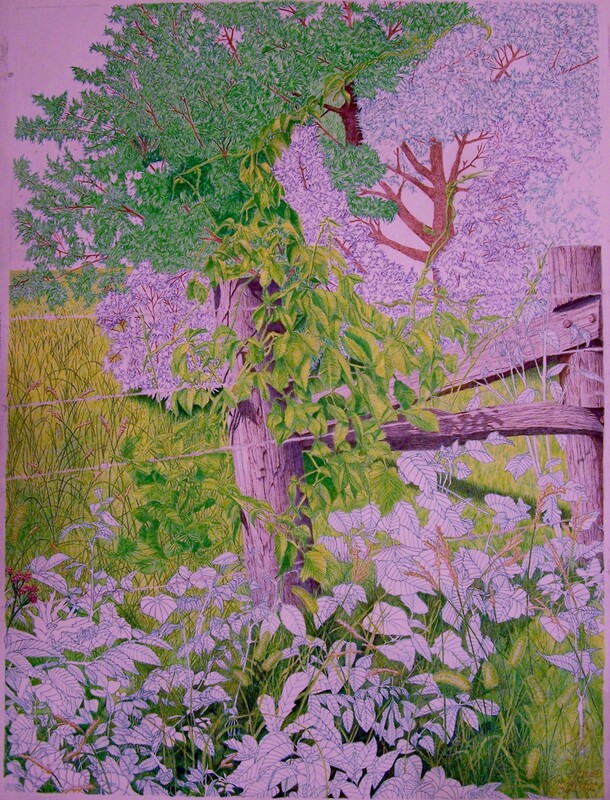 • I was on a roll when I began inking the cedar foliage and decided, therefore, to postpone drawing the barbed wire until later. • All of the cedar foliage is now "complete". Adjustments of the shadows to increase depth will be made during the final detailing phase. • The shadow on the grass from the nearby cedar foliage is also expanded (located in the picture just below the fence post's anchor beam on the right). • Next, I will detail the form and shadows of the central plant to render it more precisely and to help make it stand out against the cedar foliage. • The drawing is now complete. The remaining foliage in the foreground is completely developed, the grass beneath the foliage and behind the fence has been sculpted and shadowed, the blue sky has been deepened, and the cedar foliage has been detailed. 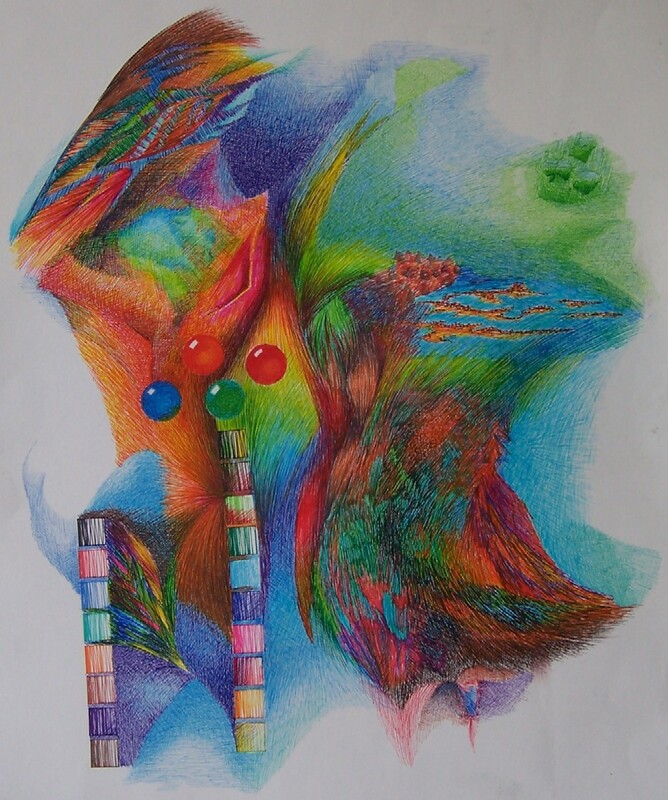 • This piece took an extraordinary amount of time to complete but the results made the effort worth the time. I just purchased a complete set of Prismacolor Double-ended markers and am looking forward to exploring the full color range and ease of use. Of course, I will need to adopt a looser style since the thiness of the line width of these markers is much greater than I am used to.